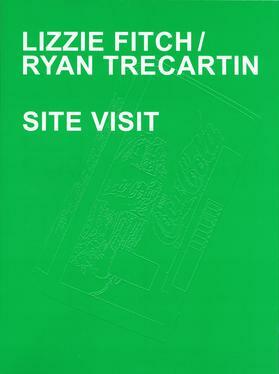 On the occasion of the debut of Lizzie Fitch / Ryan Trecartin’s sound and video installation Site Visit (2014) at KW Institute for Contemporary Art, this volume features essays by curator Ellen Blumenstein and critic Thomas Miessgang expanding on the work’s themes, structure, and complex sonic composition, as well as an image-based presentation of the exhibition and video. The six-channel video component of the work was shot in a former Masonic temple in Los Angeles. Inspired by its unusual organization and structure—a five-story warren of large, cavernous rooms akin to a convention center—the movie’s protagonist is the building itself. Echoing the game-like narratives from the movies comprising Priority Innfield (2013), it is the premise-driven context that locates agency and meaning in Site Visit. Starting as a spatial soundscape, Site Visit unfolded over a number of anterior rooms and evolved into a complex installation in the exhibition hall. In this part of the exhibition space, the artists presented a six-channel video on projection screens situated in a way that mirrors the video’s own 5.1 surround sound, engaging the visual, sonic, and physical fields as a combined object.